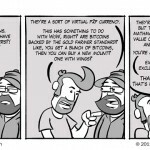 [Posted 6/22/11 ] I’m still a few comics behind. Thanks for your patience. This comic is part true story, and part half-imagined night terror. Seriously, this comic is like when you first wake up and try to remember your dream. The ideas are there but you can feel them slipping away by the second. Is… is that your father? No… it’s Mr. T, but he is SUPPOSED to be your father. Well, that’s what writing it was like, at least. I’ve read it at least a dozen times and I can’t come up with a decent explanation for the sheer level of unsheathed bizzarre let loose in its panels. Did they somehow weaponize an airborne version of Four Loko? Am I “Wide Awake Drunk [TM]” and comicing? Am I currently in a Navajo sweat lodge, purifying my soul with peyote as this comic is whispered to me by the King Of All Raccoons? Was it something as pedestrian as lack of sleep? Nah, it’s probably the magic raccoon thing. The nugget of honesty is this unwinding tapestry of madness comes from the fact that I wanted to watch Return of the Living Dead III at my birthday party (it’s FANTASTICALLY terrible) and Josh couldn’t find it on his super secret, private, special space cadet decoder ring bit torrent site. He also refused to download it from a public torrent because he’s so above that and better than the rest of us. I’ve probably gotten him in trouble with Anonymous of Lulzsec or whoever just by mentioning that such a site even exists. Oh well. As to why I had the Ernest movies on the brainparts, I cannot discern. Again, I’m looking to the Raccoon King for answers, but all I’m getting are scraps of river-washed apple spit at me and tiny, deep claw wounds on my face. COMMENTERS: I challenge you to 1) Come up with the Ernest movies of the last 10 years that Jim Varney never got to make and/or 2) Put Ernest in other classic movies. For instance Schindler’s List becomes Ernest Goes to Concentration Camp. Roots becomes Ernest Slaves Christmas. Wow, those were both really offensive. That just sort of happened. Sorry. BIG NEWS! 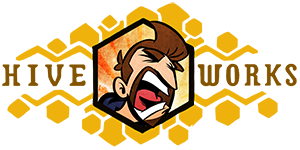 The HijiNKS ENSUE Store will be shutting down for a while so I can make some big exciting changes. 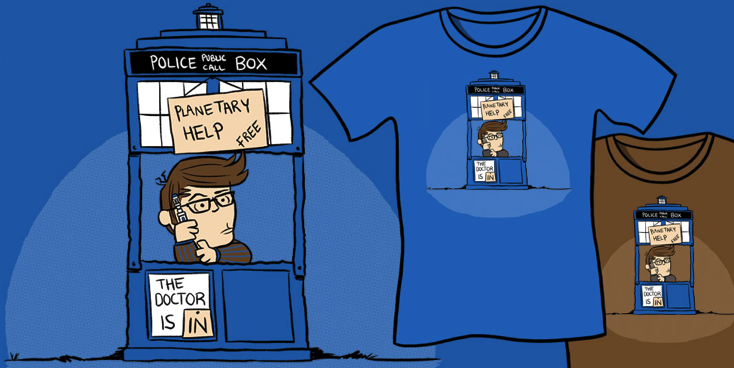 If there is a shirt you want, and you DON’T WANT to wait until sometime after San Diego Comicon, you should probably buy it now. This week will be your last chance for a at least a few weeks. Please check out this blog post to see which designs won’t be coming back in case you want one of those. NEWS2: You can hear me briefly on this ABC Australia podcast, Nerdzilla, talking about X-Men: First Class. The full interview will be posted sometime next week. NEWS 3: I have donated a copy of HijiNKS ENSUE Volume 2: My Heart Is A Hate-Filled Pineapple to be auctioned off by the Toronto Chapter of Can’t Stop The Serenity. It features THIS SKETCH. The auction is June 18th. NEWS 4: The story I recorded for the Machine Of Death Podcast, “Loss Of Blood,” can be downloaded NOW. It’s been so long since I recorded it that I can’t remember if I sucked or not. Either way the story is very cool. I really don’t have any idea what Bitcoins are, but I’m pretty sure they’re going to usher in the economicopalypse. Now, if you’ll excuse me, I’ll be in my bunker where I’ve been hoarding canned beets and D cell batteries… both for their nutritional content. COMMENTERS: I seriously don’t understand Bitcoins. Like, not at all. NEWS! I will not be attending HeroesCon this weekend. Read more HERE. Sorry, Charlotte Fancy Bastards. 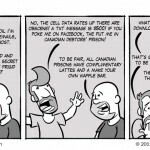 GUEST COMIC WEEK CONTINUES WITH RECKLESS ABANDON! In celebration of my 30th birthday I’m taking the week off and recharging from Phoenix Comicon (which was amazing btw). How can you help celebrate my 1/3 life crisis? Oh I don’t know… maybe donate, get something off the wish list or buy something from the store or Sharksplode? Sure. Why not. 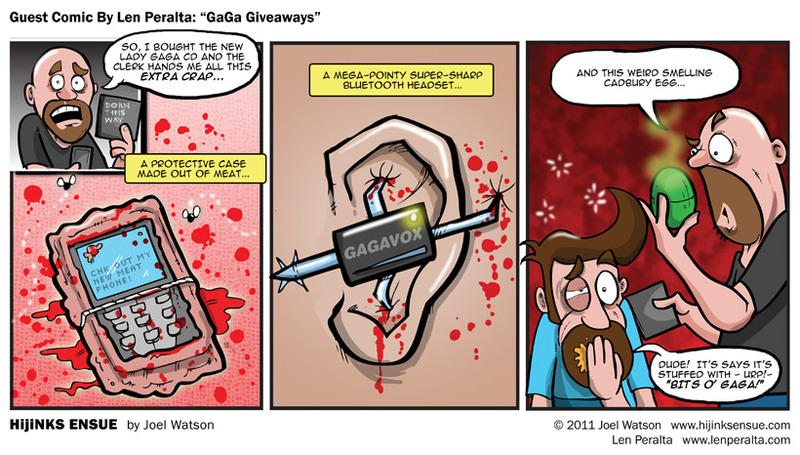 Today’s gagaguest comic comes from Len Peralta! Len is an amazing geek illustrator who has worked with Paul and Storm, w00tstock, Jonathan Coulton, John Hodgeman, Rifftrax and Wil Wheaton. He is also the creator of the “Geek A Week” trading cards and the “50 vs. 50 Project“. If you like knowing what awesome geeks are up to, follow Len on twitter. Wil Wheaton and I got excited and made a thing! 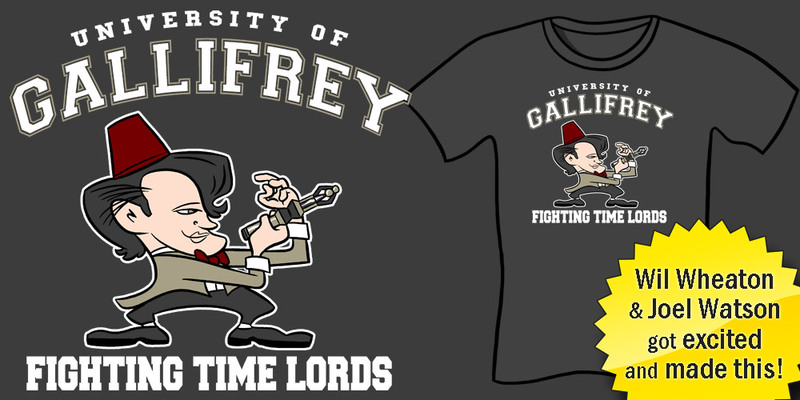 Check out our Gallifrey University Fighting Time Lords Shirt which you can purchase now over at Sharksplode. You can read more about it on Wheaton’s Tumblr and the Sharksplode Blogsplode. Splode. 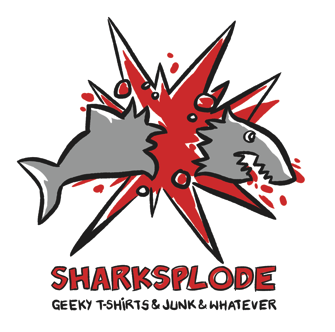 You can also get (almost) all Sharksplode shirt designs in sizes up to 5X as of today. PHOENIX COMICON IS THIS WEEKEND!!! I will be there with Kel McDonald at table 241. WHEATON and I may actually have one or two of our Gallifrey University shirts to show you and Wil will (will) have prints of the design at his table to sign for you. The comic schedule is going into “Convention Panic” mode. I hope this isn’t the last comic of the week, but it might be. I will be leaving for Phoenix tomorrow, getting back Monday afternoon then leaving again on Thursday for Heroes Con in Charlotte, NC. I’ll be taking that week off (despite working/travelling/conventioning all week) for my 30th Birthday. I have some great guest comics lined up that I am positive you will enjoy. 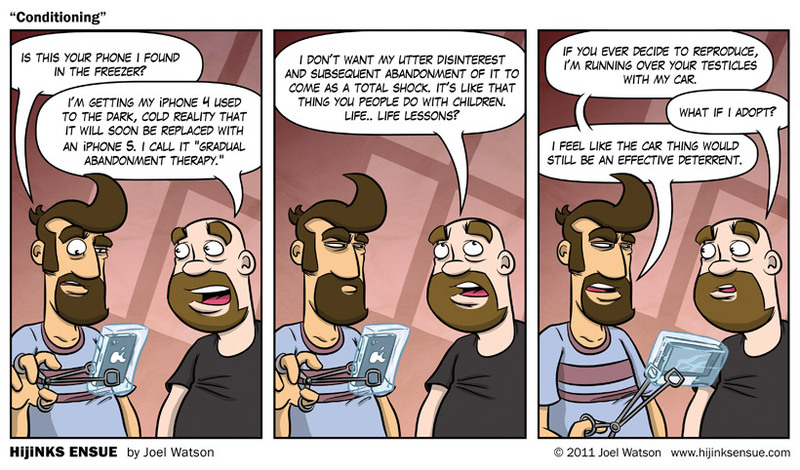 COMMENTERS: How else might Josh teach his soon-to-be-abandoned gadgets the harsh realities of the world?